Baseball schedule is very particular so we had a full week before our next baseball game at Comerica Park in Detroit. 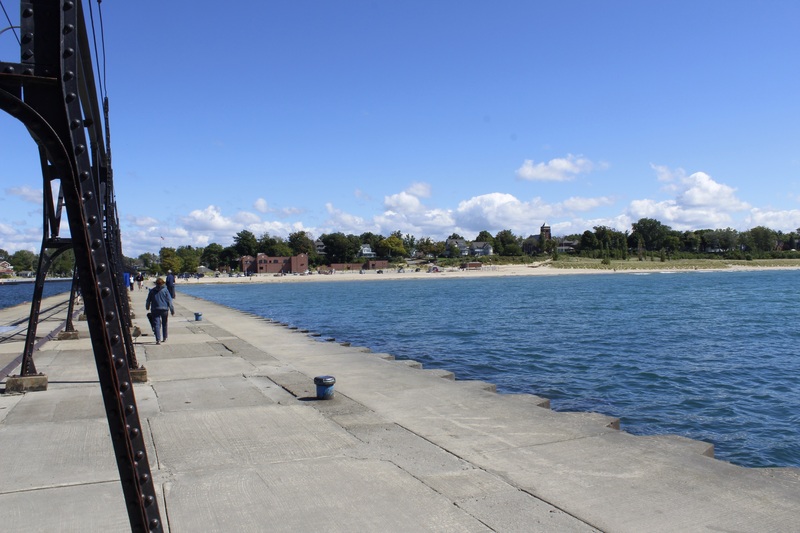 We took advantage of that and we visited a few towns in Michigan: South Haven and Kalamazoo. We have to say we are getting pretty excited about seeing our family and friends in a few days. Also, we are running a little low on cash! 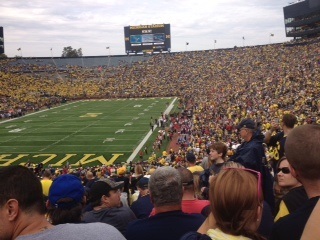 Since we already knew we’d have a long break between these two games before we left, we had look over to catch a College football game: we had bought tickets to see the Michigan Wolverines. For those who don’t know about that team, they are playing in a stadium call: the big house. It bears this name since its capacity is 109,000 fans! Really impressing! We started our day pretty early. 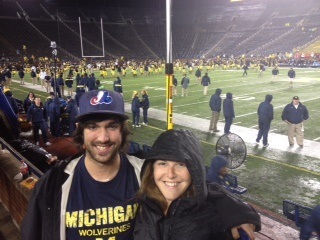 We got to Ann Arbor at 8h30 AM and the game was scheduled to be at 3h30 PM! We’ve been told to get there early if we wanted a good spot to tailgate! People are getting there as early as 7 AM, our which the parking are opening their gates. 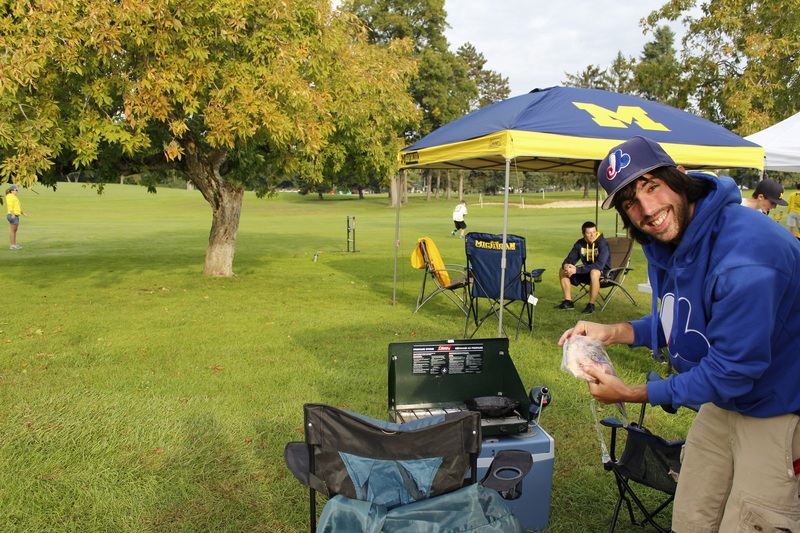 We parked on the university’s golf course (at big price…) and it is where we’ll get our tailgate on! We cannot say how many people were out there but we were a lot! The fans in Michigan were all nice to us and came to talk with us when they were seeing our van. A lot were Tigers fans and talked to us about that team. 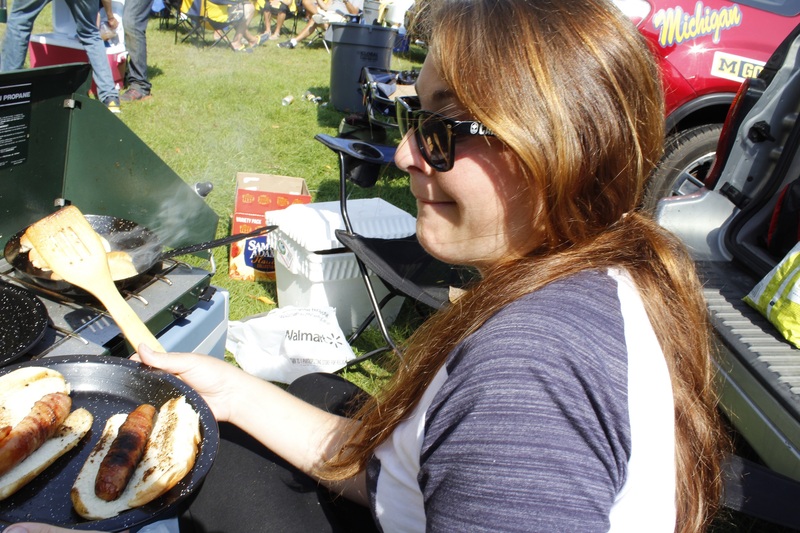 We were ready for breakfast: eggs and bacon and for lunch: wrapped in bacon hot dogs! The tailgating experience is impressive out there. Before getting to the stadium, we visited the Schembechler hall where the team as built a hall of fame honoring the football team. 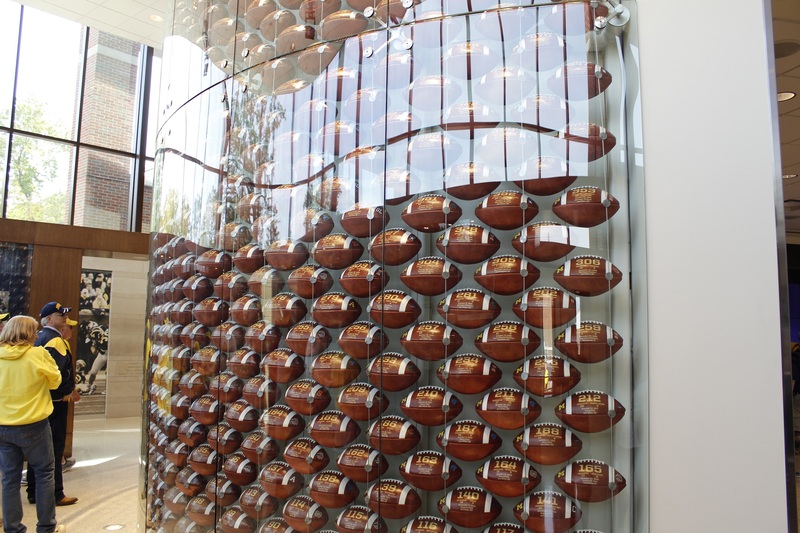 In it, we saw many artifacts of the team and the biggest feature is a wall filled up with a football for every win in the team history. We finally got into the Big house. It is really impressing since it was caved in the ground. So when you look at it from the outside, it doesn’t look that big but wait until you get inside! We got to our seats early to watch the marching band making its way to the stands. 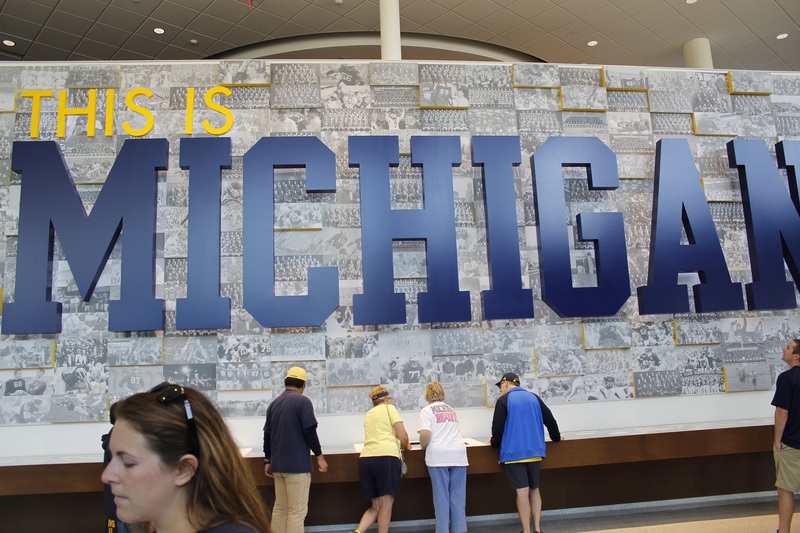 During the whole, we will try to learn the Wolverines fight song: the victors. The Wolverines are not the powerful team they used to be in the past years (they are the college football team with the second best percentage of win in their history: .732). They were playing against the Utah Utes. 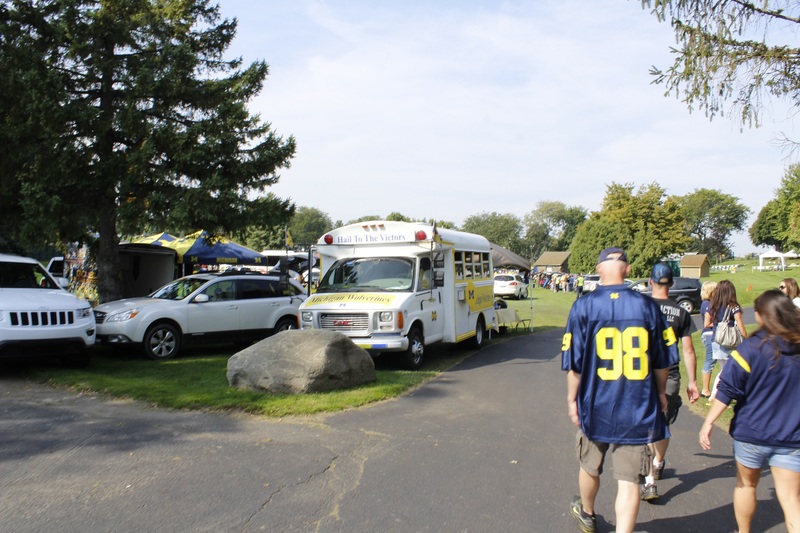 During the tailgate, fans told us that the win was far from acquired today! The Wolverines started good with a field goal on their first drive but the Utes capitalized on all their chances: successful long field goals, punt return for a touchdown and pickoffs. It was 26-10 for Utah in the 4th quarter when heavy rain and lightning forced the officials to stop the game and we were asked to take shelter in the stadium. We both have a way to do things: we don’t leave a sporting event before the end (never ever!). We will wait for 2h30 with mostly Utah fans since most of the Wolverines fans left the Stadium. After a while we got offered courtesy popcorn and hot dogs! 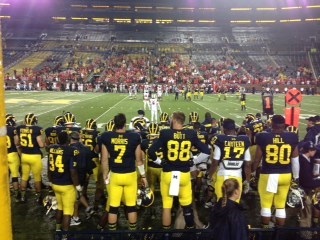 Since the game was mostly out of reach for Michigan, when they permitted us to go back to the stands, we got to get great places: first row right behind the Wolverines bench. We still supported the local team till the end even if we were in minority compared to the Utah fans that gathered on the other side! Still impressing to see the first part of a game with 100,000 people and the ending with less than 5,000! It still was a great experience for us at Michigan and we loved the Wolverines fans attitude. We went back to live in our Wal-Mart parking lot for the next two days since we have been told not to sleep in the Detroit area in our mini-van! The weather was not helping us: we had strong winds and heavy rains but we definitely prefer that it rains in between our games than during the games! Meanwhile, we are following with attention the post season race in the MLB! We left Jackson in Michigan on Monday morning and we took the road towards Detroit. We arrived only 1 hour before the gates opened at Comerica since we didn’t plan to visit Detroit apart from the surrounding neighborhood of the ballpark. There are a lot of parking lots around Comerica Park. 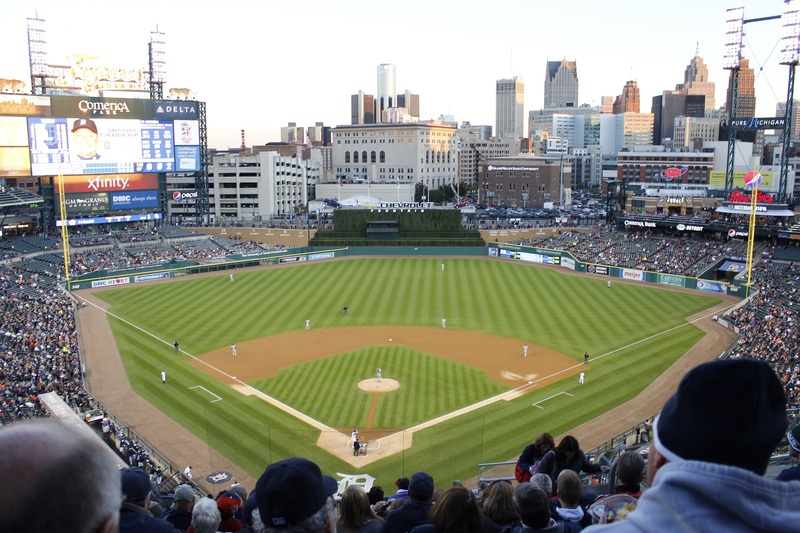 It is a downtown ballpark and it is located next to Ford Field, the stadium of the Detroit Lions (NFL team). 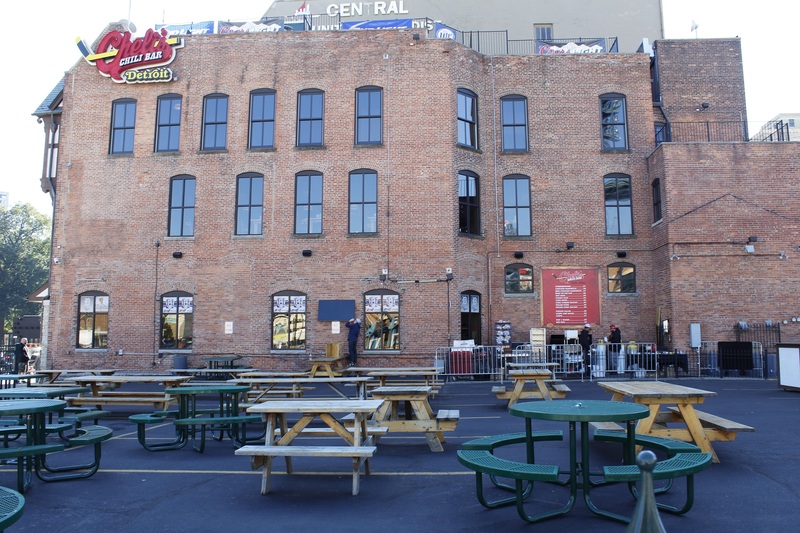 Around the ballpark, we had to go by Chris Chelios restaurant: Cheli’s Chili bar. Chris Chelios is a famous hockey player that played for Montreal, Detroit and Chicago. 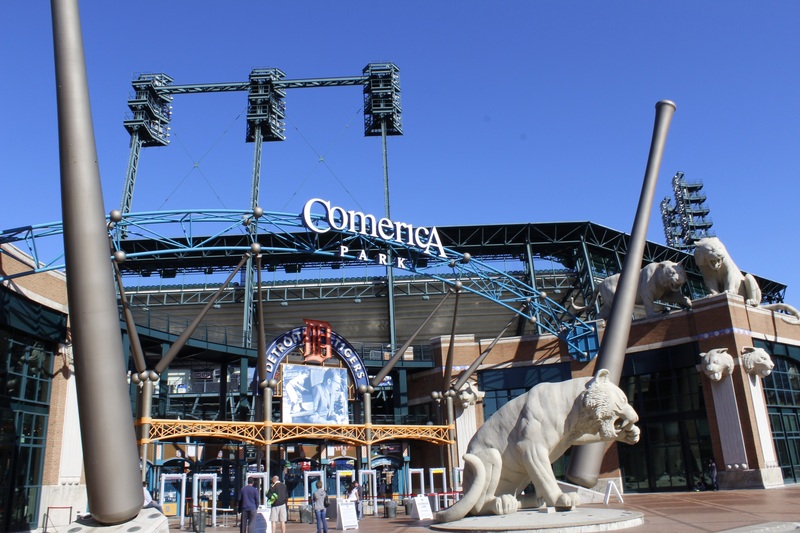 We arrived at Comerica Park and right away we were impressed with the big sculptures in front of the main entrance: two giant baseball bats and many Tigers statues. We could say that the team really takes his name seriously! We found a lot of tiger representation inside and outside of the ballpark. We went in the ballpark by the administrative offices since we had to meet with Dan Griesbaum: Suites Sales manager for the Detroit Tigers. He invited us to tour Comerica Park with him before the game. The most evident question that we could ask Dan was about the city of Detroit itself. We all have heard that the city is near bankruptcy and that the crime rate is up the roof. Dan reassured us by telling us that downtown Detroit is not as bad as people say it is. Yes there is a lot of criminality in the surrounding area but the downtown is not worse than some other cities we have visited. Around the ballpark, we saw nice bars, restaurants and theatres. Also, there is a new arena that is being built for the Detroit Red Wings (NHL hockey team) and condo towers should surround the new arena. The economic crisis was also an important question for us. We know that, in those situations, the first spending cut by individuals is the money put on activities. A lot of people in Montreal are wondering if having another sports team in town will stretch too far that activity budget for Montrealers. In the Detroit area, Dan explained us that people did budget cut on those trips out of state so they kept their money for smaller trips in Michigan and closer to their homes. This is one of the reasons the tigers survived. Also, the team decided to keep the price of tickets pretty low when they could’ve raised them. Even with all this, they lost season tickets holders and got some bad years at the ballpark when we talk attendance. Even today, the ticket price average at Comerica Park stayed pretty low compared to other teams in the league. Another question was: how long before the fans lose patience with a team that is doing good in the regular season but that cannot win the World Series. The tigers were champions of their divisions in 2011, 2012 and 2013. This year they have good chances of winning again. Their last World Series win goes back to 1984. Dan told us that the fans are close to losing interest. According to him, it this goes on, fans won’t be excited by the post seasons games in the upcoming years. Dan was wearing his 2012 American league championship ring and showed it to us! Dan gave us a quick tour of the ballpark before the game. 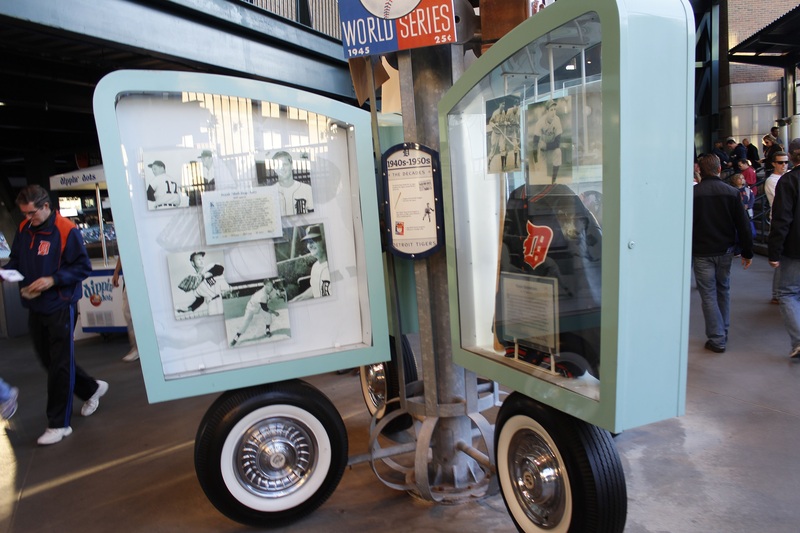 First thing that we loved was the different history stations on the main concourse of the ballpark. Every station represents a 10 years era and explained the special moment of the team during these years. 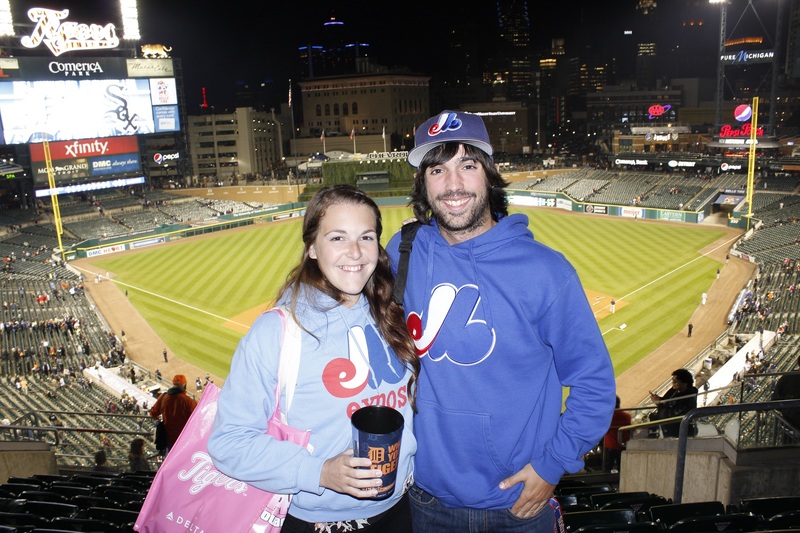 We walked to the Pepsi Porch, a huge area with sofas and a huge fire place for those cold Michigan nights. Behind center field, we observed the different statues of the players that got their number retired by the Detroit Tigers: Willie Norton, Hank Greenberg, Ty Cobb, etc. 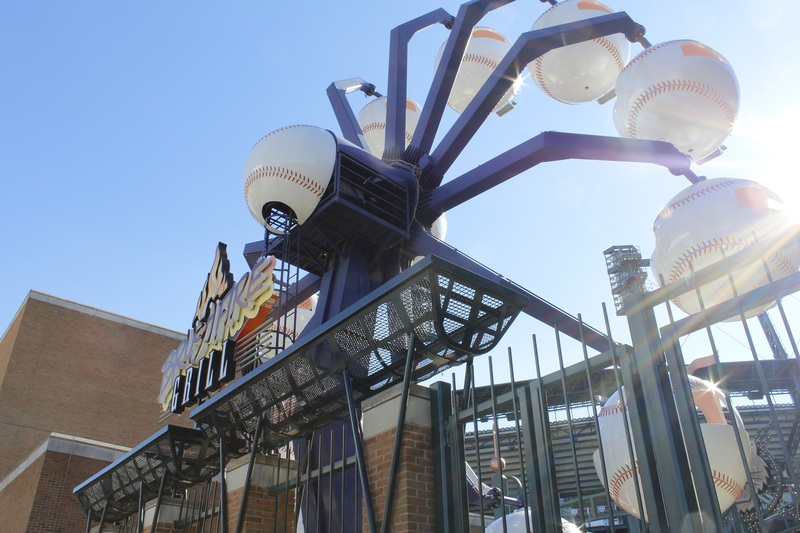 At Comerica park, they also have two ‘’carnival’’ area. One of them has a carrousel and food vendors that are selling carnival food. The other one has a Ferris wheel and an area with large Pic Nick tables so people can eat before the games. The ballpark, which opened in 2000, was supposed to be a pitcher friendly ballpark: walls were pretty far out. After a few years, they decided to bring the walls in to give more chance to the batters for home runs. 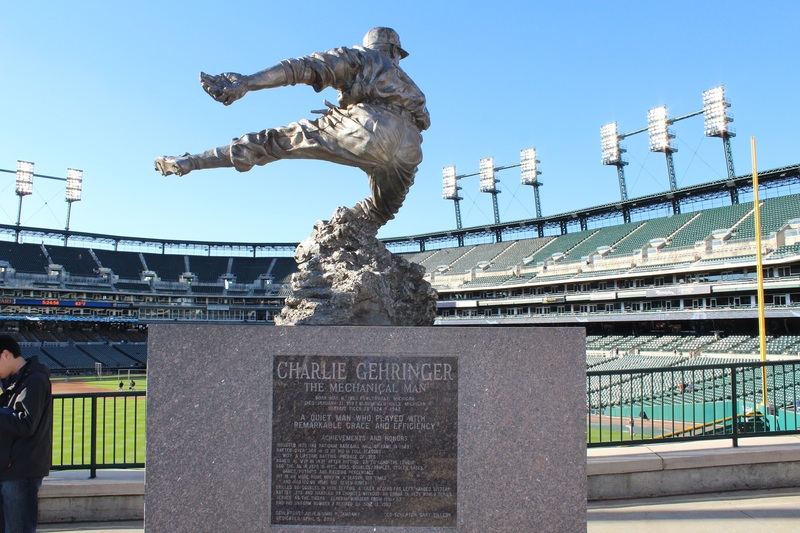 Dan told us that it was kind of sad that Comerica Park didn’t keep a big legacy from the old Tigers stadium (1912-1999): there is no particular feature that reminds the old stadium. It is a really nice ballpark just to walk around and enjoy before the game. 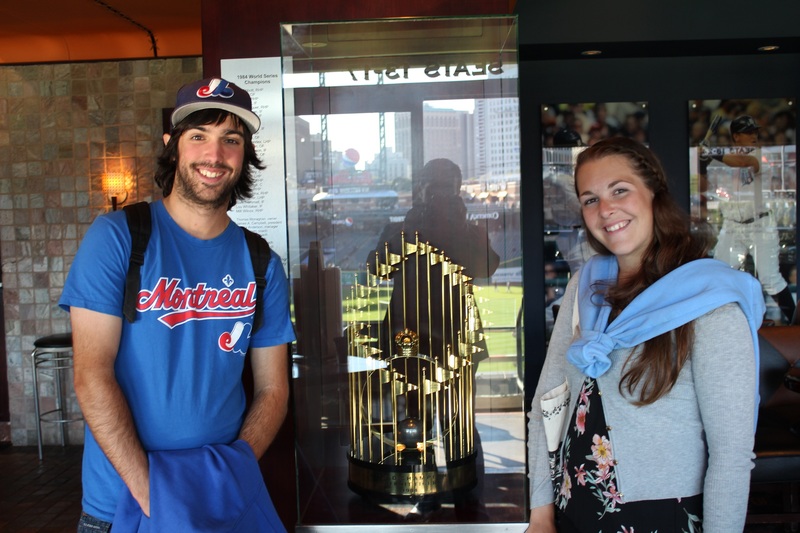 Dan guided us to the Champions club: a restaurant where people can admire the last 2 World Series trophies of the team while watching the game and getting a good meal. We have to give Dan a big Thank you for giving us that meal, touring us around the ballpark and giving us some Tigers shirts! We appreciate to have the support of the teams around the league and we love to see Jonah Keri’s book, up, up and away (the book tells the story of the last years in the Expos history) on Dan’s desk. Dan and the Tigers are more than welcome in Montreal for a preseason game in the upcoming years! After filling up on food at the Champions club (we told you we are running low on money!) We headed to our seats. 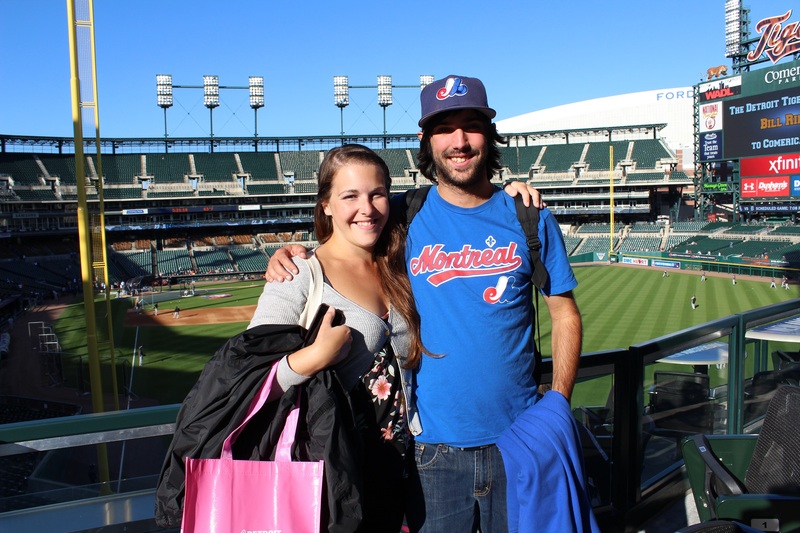 The tickets were offered to us by Don Davis, a Tigers fan who heard our story. His wife and he were nice enough to offer us the tickets and a good breakfast on the day before the game. Don was wearing his old Expos hat. It was nice for us to see that logo all around America! Thanks a lot for the tickets: right behind home plate on the upper deck, those are our favorite places! For the game: the Tigers were playing against the Chicago White Sox. Starting pitchers were Kyle Lobstein for the Tigers and Chris Bassit for the White Sox. Good start for the Tigers, Torii Hunter did a great catch at the wall to save a double right away. In the 2nd inning, Carlos Sanchez hit a ground-rule double at center field. The next batter, Tyler Flowers, will hit the ball at the same spot but without the bounce: homerun and 2-0 White Sox. 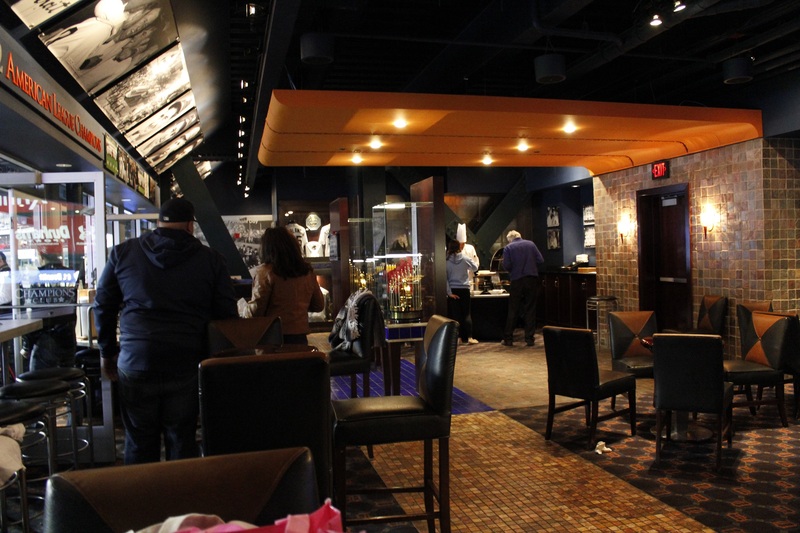 We took a break and headed back to the Champions Club to grab dessert and a coffee. Alex Avila was coming back to the lineup today and he had a rough day: 0 for 4 with three strikeouts. The two pitchers did solid work during the game. Tigers were getting a few hits but couldn’t get a run. Jake Petricka came up to the mound in the 8th inning to finish the game for the White Sox and he did: White Sox wins 2-0. By the way, that was the last time we would get to see Paul Konerko playing for the White Sox since he will retire at the end of the season at age 38. He made the All-Star team 6 times and won the World Series in 2005 with the White Sox. The Tigers are in a really tight race for the playoffs with their rivals: the Kansas City Royals. They missed a good chance to distance them last night but at least the Royals lost one of their two games yesterday. 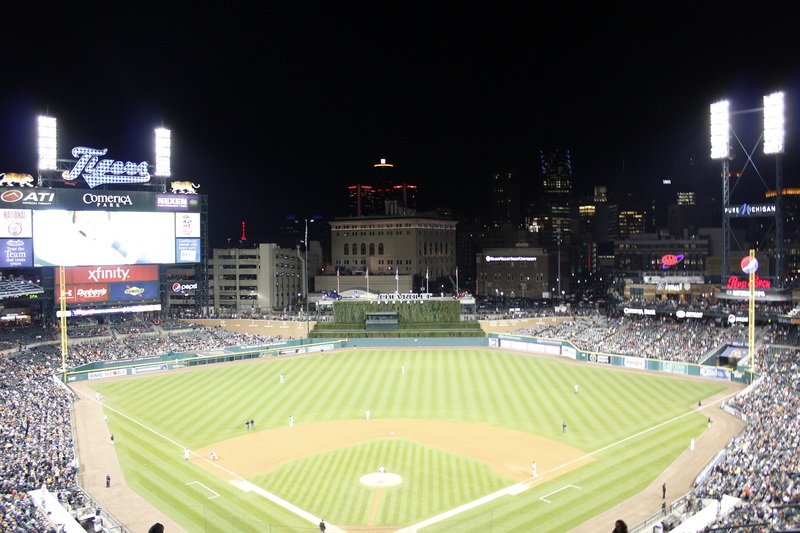 We loved the atmosphere at Comerica Park last night. 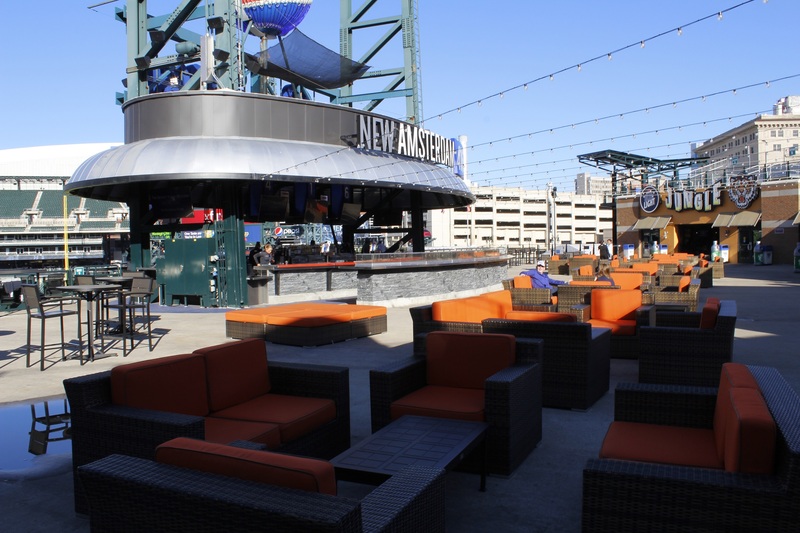 We heard great things about the sports fan in Detroit. Many fans were wearing Red wings hats or t-shirts as the hockey pre-season games or beginning this week. We realized that the fans were happy to have a winning team even if last night they didn’t do that much to satisfied their fans. A lot of teams would dream of the Tigers lineup: Miguel Cabrera, Ian Kinsler, Torii Hunter, etc. And let’s not talk about their pitching rotation: Justin Verlander, Max Scherzer and their latest acquisition David Price. Many teams are considered dangerous in the upcoming post season and we believe that Detroit should not be forgotten. We’d like to give a big thank you to Dan for the tour and to have taken the time to answer all of our questions. Also a big thank you to Don for the great tickets! We are leaving Detroit heading towards Cincinnati and a game at Great American Ball Park. P.S. Like at many other ballparks, at Comerica Park, in between innings, fans can answer questions and win prizes for their whole row. But in Detroit, if you get the wrong answer, the row behind you wins! Very funny!